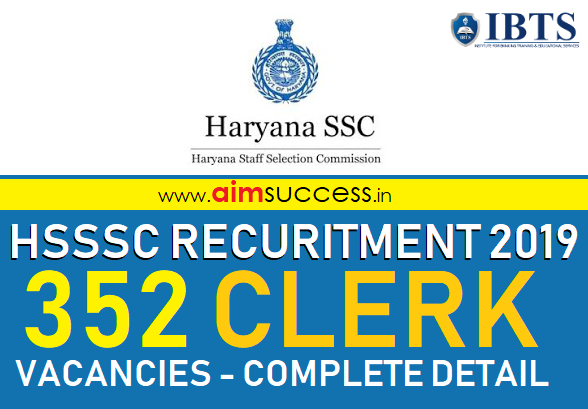 HSSSC Clerk recruitment 2019 notification! HSSSC has released the recruitment notification for the 352 vacancies of Clerk posts in the High Court of Punjab & Haryana. The online application for HSSSC Clerk 2019 has started and the last date to apply is 07th February 2019. The HSSSC Clerk 2019 exam is expected to be held in the month of April/ May 2019 as per the official notification. Candidates interested in applying for the HSSSC Clerk post can check below the important dates, no. of vacancies, eligibility criteria, application form, selection procedure, exam pattern & much more. Ex-servicemen of Haryana 18 42 + military services added by 3 years. To be eligible for the post of clerk in High Court of Punjab & Haryana, the candidate should possess a degree of Bachelor of Arts, or Science or equivalent from a recognized university. He/she should have also passed matriculation examination with Hindi as one of the subjects and must have proficiency in operation of computers (word processing and spreadsheets). HSSSC Recruitment 2019 Online Apply - Direct Link! How to Apply online for HSSSC Clerk Recruitment 2019? Step 1: - Go to the official website of HSSSC. Step 2: - Click on the recruitment link of clerk shown on the home page. Step 3: - Click on the online registration (step-1 registration). Step 4: - Enter the complete details as per your official documents. Step 5: - Submit the application form and pay the application fee. Step 6: - Download the receipt of the form. Step 7: - After this go again to step 2 & click on “Login for Step-II”. Step 8: - Upload the photograph/signature, & qualification. Step 9: - Click on the submit button. There is a negative marking of 1/4th mark for every wrong answer. Candidates will be called for CPT i.e. to access the proficiency of candidates in operation of the computer (word processing and spreadsheets) only after qualifying the written examination.